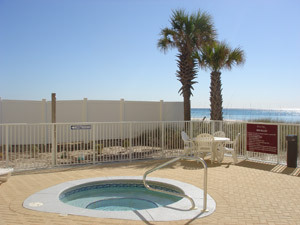 Ocean Ritz is an upscale, gulf-front resort that is located in the heart of Panama City Beach, close to all kinds of shopping, fantastic dining, and exciting attractions and entertainment. Ocean Ritz is an ideal address for those who are seeking a peaceful beach lifestyle but who also desire a close proximity to daily conveniences. Ocean Ritz condo resort features just 63 units in this 22-story complex and with only three units per floor, boasts a level of intimacy and luxury that is hard to beat. All units comprise of either a 3 bedroom/3 bath or a 4 bedroom/4 bath floor plan with extra-large rooms and balconies, allowing for an uncompromising amount of living space. 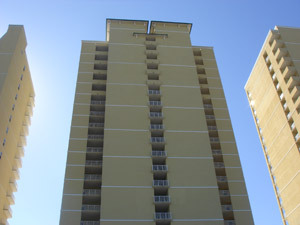 Ocean Ritz condos in Panama City Beach boast a centralized location in the heart of the entertainment district. The resort is within walking distance to many great restaurants, shops and attractions, and is just a ten minute drive to the west end of Panama City Beach where Pier Park and Frank Brown Park are situated.